Six uniquely talented musicians, all women. Skilled in high-tech methods of making music and generating sounds, they mix sophisticated pop vocals and lyrics with techno, dance and world music influences. Their original sound features custom digital samples played on unique electronic percussion instruments-- MIDI marimbas, MIDI drum controllers and 6' MIDI bamboo "trigger sticks"--all of which they invent, design and build themselves. D'CuCKOO's music is characterized by engaging sonic depth and dynamic playing style. It's straight from the heart--yet the lyrics display the intellectual and political sensibilities of "one shared vision"--and the band never forgets that music is founded upon rhythm. D'CuCKOO's high-energy live performances are multimedia events, accentuated by live video, computer graphics and interaction with the audience. D'Cuckoo shows are innovative and surprising, with interactive "showtoys" such as the famous D'CuCKOO MidiBall and RiGBy, an animated, 3-D, computer-generated puppet. RiGBy is generated in real time by a Silicon Graphics Iris Indigo. 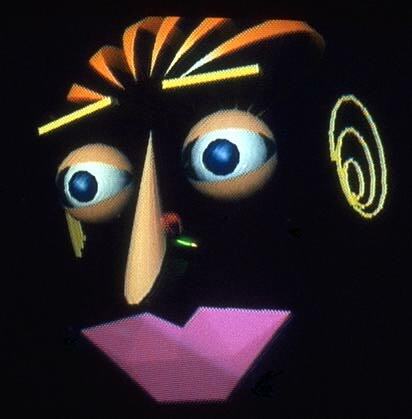 RiGBy's facial features and position are controlled by Ron Fischer, D'CuCKOO's "digital puppeteer"; RiGBy's voice is an alter-ego of Linda Jacobson, D'CuCKOO's "Virtriloquist" (virtual "ventriloquest"), who riffs from offstage with the band and audience. 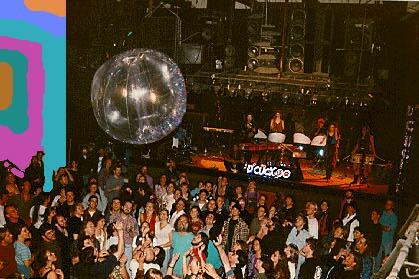 The D'CuCKOO MidiBall is a giant, wireless, helium-filled sphere that the audience bounces around like a huge electronic volleyball. Each touch triggers new sounds and visuals while the band lays down a groove. The D'CuCKOO MidiBall has been featured on the Discovery Channel, NBC-TV, Toronto's CityTV, and other international broadcasts. Co-founders Tina Blaine (known as "Bean") and Candice Pacheco (known as "Candice") were told time and again that they were crazy for wanting to create their own instruments. But hey! They did just that, designing and building their customized, glowing MIDI marimbas and multi-pad MIDI drum controllers they call "turtles." When struck by mallets, these instruments convert electrical signals into MIDI data, which in turn trigger digital samplers and synthesizers, allowing the music to sound like anything--from traditional acoustic marimbas and drums to an unlimited range of other sounds. Click here to hear a sound clip from the latest CD release, *UMOJA* (918k). Click here to hear a sound clip from *D'CUCKOO* (999k). The current D'CuCKOO tribe consists of:[L-R:] Janelle, Bean, Candice, Linda (RiGBy), Jenn, Terrie, Kim.